Purpose This experimental study is to know what the safe zones and angles of half-pin insertion in lumbar vertebrae are, and if there are other new sites for half-pin insertion. 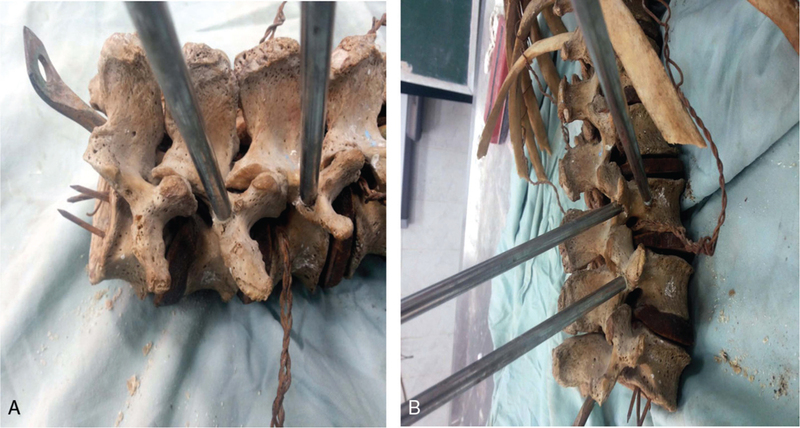 Materials and methods A cadaver study using two bony and four cadaveric specimens was undertaken to examine the safe sites for half-pin insertion in the lumbar vertebrae. Half pins were inserted into specific demarcated sites. Results From our study we suggest that the pedicle of the lumbar vertebrae is a safe and strong region for the insertion of the half pins with 10°–40° divergence from the midline, where the new site of half-pin insertion in the vertebral body anteriorly and at the level of transverse process is safe at an angle that lies between 50° and 60° from the sagittal plane in L4 and L5. Conclusion We concluded that the application of external fixators in the lumbar spine is valuable with good safety margins of half-pin introduction in both the pedicle and the vertebral body. In 1977, stabilization of lumbar and lower thoracic spine by an external fixator had been developed; the system consisted of two levels of Schanz screws inserted into the vertebral bodies through the pedicle, held with an external fixator device . 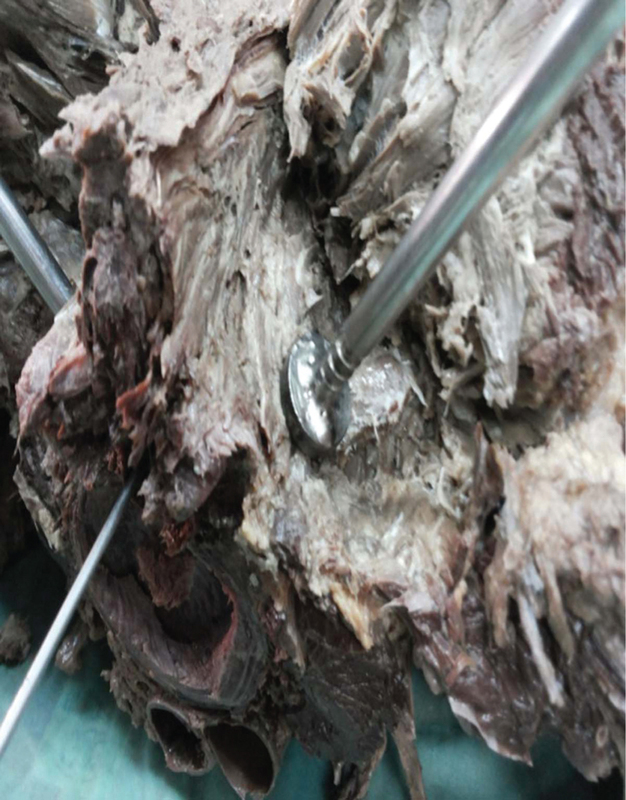 External fixator application in the field of unstable spinal injuries, spinal osteomyelitis proved as an effective alternative, as the Schanz screws are firmly anchored to the vertebral bodies through the pedicles . Magrel had proved that external fixators are effective in the treatment of unstable spinal injuries, spinal osteomyelitis, as it was superior in comparison with rods in biomechanical stability tests; it also allows for compression, distraction, or neutral fixation . The purpose of this experimental study is to know the safe zones and angles of half-pin insertion in the lumbar vertebrae, and if there are another new sites for half-pin insertion. The study was approved by ethical committee of Banha University and were in accordance with the ethical standards of the institutional and national research committee and with the 1964 Helsinki declaration and its later amendments or comparable ethical standards. Two bony vertebral column composed of lumbar and dorsal spine with ribs attached to the dorsal vertebrae, and four preserved cadaveric specimens were used. Three of them consisting of lumbar and dorsal spine with a coronal cut at L4 show inferior vena cava and abdominal aorta, right and left kidneys with their corresponding ureters, the chest was opened. The other cadaveric specimen was for the demonstration of the abdomen and pelvic visceral organs with their blood supply; the whole thoracic and abdominal parts of the aorta and inferior vena cava were present with their pelvic branches and tributaries; the nerves of iliohypogastric, ilioinguinal, and femoral nerve were present ([Figure 1]). 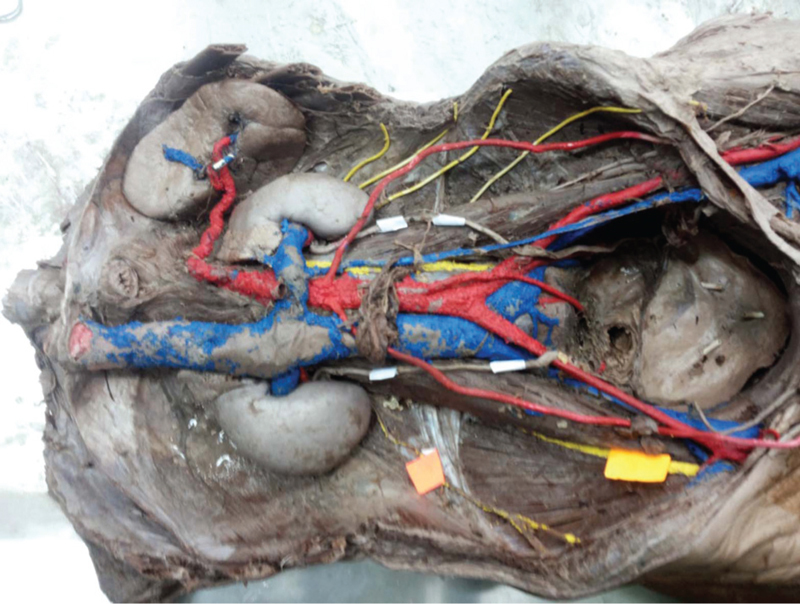 Figure 1 Cadaveric specimen showing abdominal aorta and its branches (red color), inferior vena cava and its tributaries (blue color), both right and left kidneys, spleen, iliohypogastric, ilioinguinal nerves (yellow color), and both ureters (white labeled). The external fixation set used included 5-mm half pins, 3.2-mm drill bit, and a power drill. The bony specimens were examined to show the best sites for half-pin insertion. The data were collected by direct observation of the site of half-pin insertion and measurement of the distance between the site of half-pin insertion and the important structures. 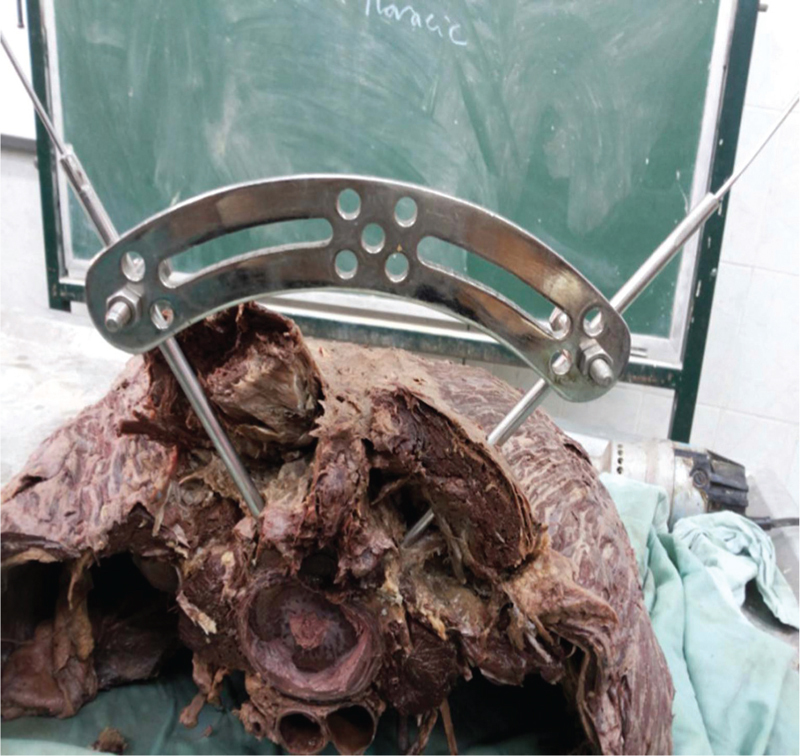 The bony specimens were examined to show the best sites for half-pin insertion, the pedicles of the third and fourth lumbar vertebrae were demarcated, and the part of the vertebral body anterior to the root of transverse process was examined for half-pin insertion. But in the first and second lumbar vertebrae only the pedicle was demarcated for half-pin insertion. To study the possible safe angles and directions of half-pin insertion in the pedicles of lumbar vertebrae, insertion of 6 mm half pins were performed in the demarcated sites on the bony specimens, with divergence from the midline of about 10°–20° in addition to insertion of half pins in the vertebral bodies of the third and fourth lumbar vertebrae anterior to the root of the transverse process ([Figure 2]a and [Figure 2]b). Figure 2 (a) Transpedicular half pins in the bony specimen. (b) Transpedicular half pins and body half pin in front of the root of the transverse process. 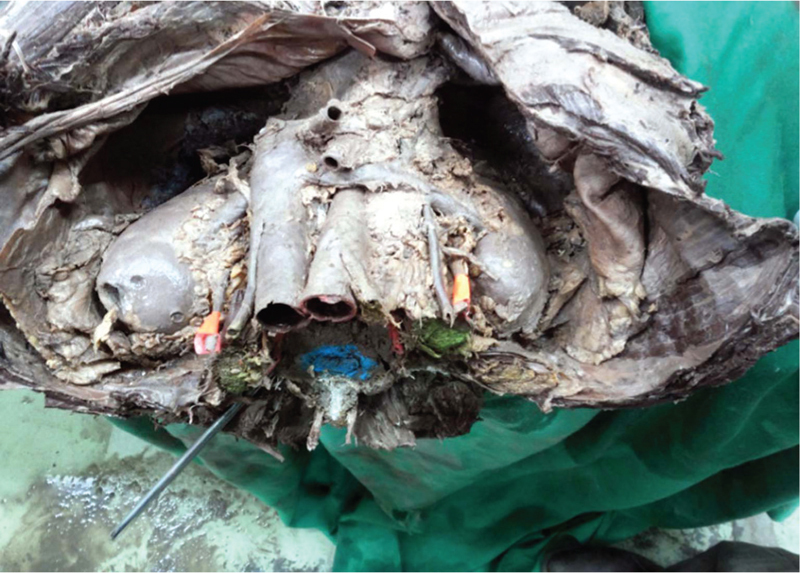 The cadaveric specimens were dissected to show the important structures; these steps were repeated again in the cadaveric specimens to study the relation of pin insertion sites to the important anatomical structures ([Figure 3]a–[Figure 3]c). Figure 3 (a) Guide wire in the right pedicle of L3. (b) Cannulated half pin in the pedicle of L3. (c) Guide wires and cannulated half pins in the right and left pedicle of L3. We remove the half pin in the right pedicle and we replace it by a stopper half pin to see the position of the stopper, then on the left side of the fourth vertebra anterior and at the level of the transverse process another 6 mm half pin was inserted into the vertebral body at an angle diverted from the midline of about 40°50° ([Figure 4]). Figure 4 Half pin with a stopper washer. In each step, we measure the angles of inserted half pins from the sagittal plane, we did a cross section in the fourth lumbar vertebra to see the relation of the inserted half pins to the spinal canal, the spinal canal and the spinal cord are labelled in blue ([Figure 5]a and [Figure 5]b). Figure 5 (a) Calculation of the angle of divergence for both left transpedicular half pin and left body half pin. (b) Cut section in the lumbar vertebra no.4 showing neuronal canal marked in blue and the tract of both pedicular and body half pins. The cadaveric specimens were dissected to show the transverse lumbar arteries which originate from the back of the aorta and pass transverse around the vertebral body and deep to the psoas major muscle; then we measure the distance between the body half pin and the lumbar artery. We also measure the distance between the body half pin and the abdominal aorta, inferior vena cava, and the ureters ([Figure 6]a–[Figure 6]d). Figure 6 (a) Relation between the body half pin on the right and left. Side and segmental lumbar arteries (red color) originate from the back of the aorta and pass to both sides under psoas major muscle (green color), transverse process (white color), and spinal canal (blue color). (b) Measurement of the distance between the body half pin and the segmental lumbar arteries. (c) Distance between the body half pin and the inferior vena cava. (d) Distance between the body half pin and the aorta. Both kidneys are anatomically located at the level of L1 to L3, so we limit the application of the half pin in the new site only for lumbar vertebra numbers 4 and 5 ([Figure 7]). Figure 7 The location of right and left kidneys in the front of lumbar vertebrae. We finally assembled the external fixator composed of two half pins inserted into the pedicle of the third lumber vertebra and connected to each othe by ilizarov arches ([Figure 8]). Figure 8 Illizarov construct for one-level stabilization. With regard to the site of insertion and the direction of half-pin insertion, it was found that the pedicles of the all lumbar vertebrae are safe regions for insertion of the half pins within the 10°–40° divergent angle from the midline. However, the new site of half-pin insertion in the vertebral body anterior and at the level of the transverse process is safe at an angle that lies between 50° and 60° from the sagittal plan in the fourth and fifth lumber vertebrae where the first, second, and third vertebrae not amenable for this new site of half-pin insertion as there is high risk of injury of both kidneys. At the level of the fourth and fifth lumber vertebrae, the lumber arteries on both right and left side are located 0.5–1 cm inferior to the transverse process of the corresponding vertebrae, while the urteres on both sides are about 4.5 cm anterior to the new site of half-pin insertion in L4 and L5, where the aorta and inferior vena cava are about 3–4 cm away from the new site of half-pin insertion in the vertebral body ([Figure 6]a–[Figure 6]e). Since 1977, Magerl had developed his external fixator device for the stabilization of the lumbar and dorsal vertebrae in the field of spinal trauma and infection. The system consisted of two pairs of Schanz screws and an adjustable external fixation device . Biomechanically, the external fixator showed more stability than the rod distraction system and fixation with plating as the Schanz screws can securely be anchored through the pedicles into the vertebral body ,. In February 2006, Fenichel had published a case report about using external fixation for the treatment of osteomyelitis of the D2 vertebra with an epidural abscess caused by Actinomyces israelii that spread from the lung and was treated by decompression and external fixation . In 1999, a study was published on experimental external fixation combined with discectomy in the management of scoliosis in young rabbits. The results of this study suggest the versatility of the external fixator that allows derotation which offers a feasible method of managing scoliosis in the human adolescent . Soini et al. had published the usage of external transpedicular fixation to the lower lumbar spine in a prospective study on 42 patients with chronic low-back pain with instability of the lumbar segment. Anatomically, the lumbar pedicles is directed backward from the upper part of the body; it represents a prominent structure that is suitable for Schanz screw fixation . With regard to the previously anatomical, clinical, and experimental studies, it was suggested that the pedicle is the safest and the strongest site for half-pin insertion in the lumbar vertebrae. In this current study, the authors prefer the pedicle as the first site to be chosen for half-pin insertion in all lumbar vertebrae. Magerl concluded that the Schanz screws should lie parallel to the end plates with an inclination toward the sagittal plane of about 10″ at the thoracolumbar junction, increasing up to 15–20″ at L5. The larger size of the pedicles in the lower lumbar area offers more margin of safety for the placement of the screws . In this experimental study, the authors went in the same line with the study done by Magerl and they offer a more safe zone of angulation of up to 40° in the pedicular half pin and the authors suggest another new site of pin insertion in the vertebral body anterior and at the level of the transverse process with a safe zone that lies between 50° and 60° divergent from the center, which is represented by the lumbar posterior spinous process, which is preferable in lumbar vertebrae numbers 4 and 5. To the authors’ knowledge, the new site for half-pin insertion in the vertebral body have not been discussed in any literature or experimental study. In the literature, the transverse process in the third lumber vertebrae is longer than in the second, fourth, and fifth lumber vertebrae ,. Moreover, the abdominal aorta begins at the lower level of T12, then it descends downward till the level of L4 as it terminated by the right and left common iliac arteries . Lumbar segmental arteries originate from the posterior surface of the abdominal aorta. They are four pairs and are very close to the vertebral bodies, the right ones are longer than the left . In this current study, the authors had measured the distance between the half pin in the new site and the nearby vital structures. They found that the lumbar segmental arteries lies 0.5–1 cm inferior to the transverse process of the corresponding vertebrae; the distance between the abdominal aorta, inferior vena cava, and the ureters also measured, and they considered this new site as a safe site for half-pin insertion in the lumbar vertebrae numbers 4 and 5, but the authors concluded that this new site of half-pin insertion is dangerous for lumber vertebrae numbers 1, 2, and 3 as there was possibility of injury of both kidneys. Literature on safe zones and angulations of half-pin insertion either in the pedicle or in the new site are limited, so we suggest that this study will open the door for further precise studies and more superior experimental tests as there were limitations for this current study such as the small number of cadaveric specimens and the way of preservation. From this study, we concluded that the application of external fixators in the lumbar spine is valuable with good safety margins of half-pin introduction in the pedicle and the vertebral body. This study calls for further evaluation by further investigations and by clinical application. Magerl FP. Stabilization of lower thoracic and lumber spine with external skeletal fixation. Clin Orthop Rel Res 1984; 189:125–135. Soini J, Sltis P, Kannisto M. External transpedicular fixation test of lumber spine correlates with the outcome of subsequent lumber fusion. Clin Orthop Rel Res 1993; 293:89–96. Fenichel I, Caspi I. The use of external fixation for the treatment of spine infection with Actinomyces bacillus. J Spinal Disord Tech 2006; 19:61–64. Abe J, Nagata K et al. Experimental external fixation combined with percutaneuos discectomy in management of scoliosis. Spine J 1999; 24:646–653. Pait TG, Elias AJR, Tribell R. Thoracic, lumber and sacral anatomy for endoscopic surgery, chapter 8. Neurosurgery 2002; 51[Suppl 2]:67–78.